Buy online MCP23017 I/O expander with I2C interface in India at low cost from DNA Technology, Nashik. 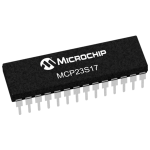 The MCP23017 provides 16-bit, general purpose parallel I/O expansion for I2C bus applications. The MCP23017 Input Output expander IC consists of multiple 8-bit configuration registers for input, output and polarity selection. The system master can enable the I/Os as either inputs or outputs by writing the I/O configuration bits (IODIRA/B). The data for each input or output is kept in the corresponding input or output register. The polarity of the Input Port register can be inverted with the Polarity Inversion register. All registers can be read by the system master. MCP23S17 I/O Expander IC with SPI InterfaceThe MCP23S17 provides 16-bit, general purpose parallel I/..
PCF8575 IO Expander ModulePCF8575 is a 16-bit I2C Input Output Expander IC. This Module is a simple ..
MCP23017 I2C Serial Interface 16 bit I/O Expander Serial ModuleThis module is the 16 way IO extensio..